We have launched our report on the last year’s work in the community and have unveiled the impact from the day to day work that we do. Before the Devils’ game against Huddersfield Giants Foundation Manager Neil Blackburn highlighted some of the key points from the report to a packed room including some startling statistics around the Foundation’s male Mental Health project – Offload. Some 20 participants of those surveyed highlighted that they believed they would have taken their own lives if it wasn’t for taking part in the successful programme which is delivered by the Red Devils, Widnes Vikings and Warrington Wolves. Other schemes such as one where elderly people stay active using boxercise have also been particularly successful. The report also highlights the large numbers of children in our local schools who come into regular contact with the Club through the Foundation. 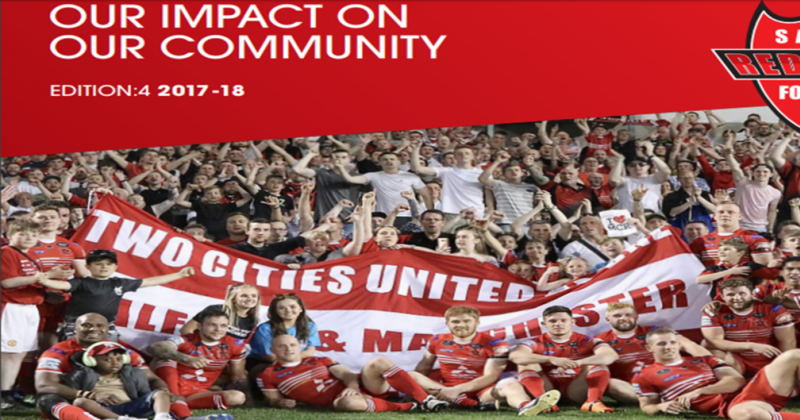 Red Devils Head of Communications, Paul McNally said: “If this is the impact report for our Foundation surely there can be no greater impact in our community than saving the lives of 20 men in the last year. 20 families haven’t had to go through the pain and suffering that suicide brings with it and it is tantamount to the fabulous success our people out in the community have had with the Offload programme.